The tale of Hassell v. Bird. I previously published a long article on the case of Hassell v. Bird, and I was invited to file a friend of the court brief in the California Supreme Court after it took up the case. My original article provides much greater detail, but briefly for purposes of this article, Bird defamed a law firm – the Hassell Law Group – in a Yelp review. Hassell sued Bird, and the court found that the Yelp “review” was false and defamatory, and ordered Bird to take it down. But then comes a twist unique to this case. Knowing that Bird would be unlikely to comply with the order, the court also ordered Yelp to remove the review, even though Yelp had never been a party to the action. Here, the trial court felt that it was reasonable to require Yelp to take down the review, even though it was not a party to the action. The review had been deemed to be defamatory, and it was not Yelp’s speech that was being attacked, so certainly Yelp would have no horse in the race. Indeed, presumably Yelp wants the reviews posted on its site to be as truthful as possible, so it should welcome an order that would result in the removal of a false review. But Yelp’s business model depends on negative reviews, so it cried foul. Even after the Court of Appeal found that the judge’s order was entirely proper, Yelp went to the Supreme Court to fight for the right to publish false and defamatory reviews. 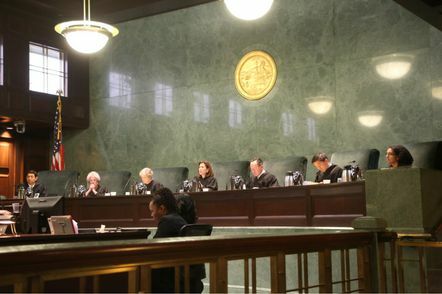 Today, I attended the oral argument held in that case, in front of the seven justices of the California Supreme Court.